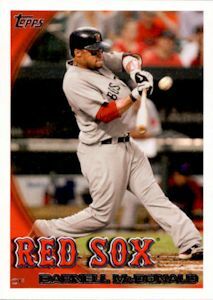 ON THIS DATE (April 20, 2010) ... Darnell McDonald, who began the day not on the team's 40-man roster and the game on the bench, did what the Red Sox have failed to do so often this season. With Jason Varitek having doubled his way ahead of McDonald, the pinch hitter slammed a 2-2 pitch into the seats above the Green Monster, pulling the Red Sox even with the Rangers at 6, inciting that crowd, and helping erase the memory of the nine stolen bases the Sox had given up earlier in the game. The fans certainly knew his name by the time he came to bat in the ninth, with the bases loaded and two outs. They stood for him then, hoping and praying he could halt Boston's five-game losing streak, and six-game skid at home. He did. McDonald's high drive scraped the wall, sending Kevin Youkilis home for a much-needed 7-6 win. His single, the one that left him in the middle of joyous, ecstatic, destructive chaos, left McDonald nearly bloodied. He was tackled in front of second base, the crowd of happy players moving all the way to short left field before ending in a pile on the ground. They were, in a word, thrilled. It was an essential win that left the clubhouse emotional afterward. They knew exactly how important this was. He was a most unexpected hero, becoming the first player to homer in his first Sox at-bat since Orlando Cabrera Aug. 1, 2004, and the first player to homer in his first Sox at-bat as a pinch hitter since Curtis Pride Sept. 19, 1997.